The round table on “Provision of Information, Advice and Free Legal Aid in Bosnia and Herzegovina“ took place on September 29, 2016. The aim of the round-table was to update participants on access to justice by providing information, advice and free legal aid to citizens of Bosnia and Herzegovina, as well as to encourage better cooperation and coordination of the activities of public institutions, civil society and the international community, in order to improve the exercise and protection of the rights of citizens in BiH. During the event, the results of “Access to Justice: Provision of Information, Advice and Free Legal Aid in Bosnia and Herzegovina” research conducted by the Association for Democratic Initiatives were presented. The publication covers the centers and /or departments for provision of free legal aid of local governments, NGOs and legal clinics. The question of the legal framework regulating free legal aid in BiH, the capacity of service providers and the current situation in practice with regard to information, advice and provision of legal assistance formed the basis of the discussions following the presentations. One of the panels focused on the availability of free legal aid in BiH for victims of hate crime. The round table was attended by representatives of public institutions, as well as representatives of civil society, and international organizations. 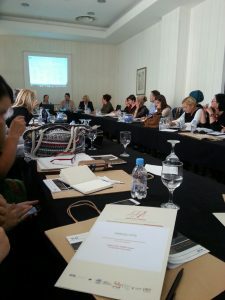 The round table was supported by the European Commission and the Civil Rights Defenders.